A traditional Irish music bar tucked in the corner of Blackstaff Square, in the city of Belfast. The bar creates a vibrant atmosphere with live music every night. The bar has a wide range of beverages as well. The crowd is enthusiastic and the service here is excellent. If you’re looking for a crazy time with alcohol and music, Fibber Magees is where you should be. How popular is Fibber Magees? People normally club together Albert Memorial Clock Tower and Kelly's Cellars while planning their visit to Fibber Magees. 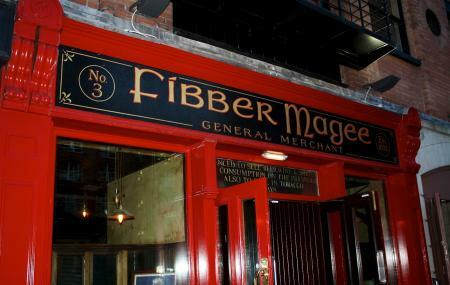 People also prefer to end their day with Fibber Magees. Terrific pub for live traditional Irish music. Very friendly crowd, you'll likely strike up a few random conversations. Get there before 8pm if you want to have bar food in the same area as the music. Recommended to anyone who wants to hear traditional Irish music when in Belfast. Great live music, great atmosphere and superb Guinness. Did not sell Gordon's Gin although they did sell Tanquery which was a bit expensive @ £6.50 for a G&T. We had a great night and the vibe was amazing. Can't wait for our next visit to Belfast to go there again. Didn’t want to serve us with teenagers at 7pm in a Wednesday. Thinking it was just the fact that we were Americans Found a place nearby who wanted our business happily. Enjoyed this place! Good drinks and friendly atmosphere. Very comfortable. Great atmosphere and music. Perfect for the tourist looking for a drink and some toe tapping with a few locals that show up.